Keesha Rivers is taking her showcase on the road. That’s right. Rivers and her team at Fla’Vore Productions will present a weekend of music, fashion, makeup and hair (and more) in Atlanta. 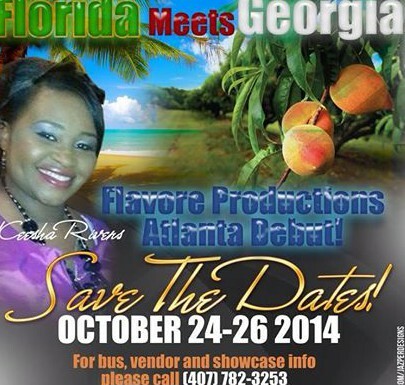 The event, appropriately titled “Florida Meets Georgia,” is Fla’Vore’s début in Atlanta on October 24-26. If you have ever attended a Fla’Vore event, you know it will be a hit. Some talented folk from throughout Florida affiliated with Fla’Vore will participate. Save the date and make plans to attend. Rivers is offering bus rides to Atlanta, hotel stay with free breakfast for two days, rides to the Downtown Atlanta station and rides to church on Sunday. For bus rides, vendor information and showcase details call (407) 782-3253.